In his 36 years of military service, Lt. General James V. Edmundson had extensive experience in combat operations and command at every level in the Air Force. He had over 10,000 hours of pilot time in 137 types of airplanes. In addition to the 107 combat missions in World War II, he led 32 combat missions in Korea and 42 in Vietnam. Two years after General Edmundson's death in 2001, his daughter, Celia discovered a trunk of his letters and was particularly fascinated with the correspondence between her father and mother, Lee. This very personal story is told through chronological vignettes, letters, newspaper and magazine articles of the period. The vignettes were written in 2000 - the letters begin in 1939 in the beautiful Territory of Hawaii. The two are interwoven and provide incredible descriptions and detail of the conditions both before and after the U.S. entry into the War; of the early fighting in the South Pacific; of the highly secret development and implementation of the Superfortress, which ultimately brought an end to Japan's war against the United States; and of the China-Burma-India Theater, as the war accelerates and the last mission is flown. 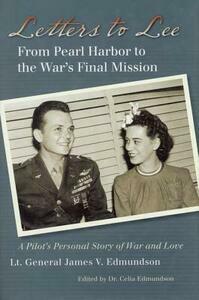 Correspondents from the United Press and Newsweek who accompanied Edmundson on combat missions enrich the story. Letter to Lee is a first person account of two of the heroes of World War II and of the love that they shared across the years and miles. They lived their lives with integrity and courage, one example of this great generation and this incredible period in time.